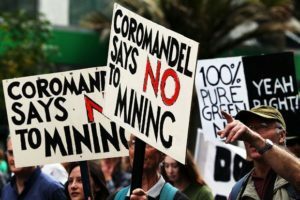 Monday 2nd November was Oceana’s first day in office after buying out Newmont’s extensive mining permits in the Coromandel/ Hauraki area. We sent a delegation to ‘unwelcome’ them, recommend that they take up recycling e-waste instead and warn them we will fiercly oppose any attempts to extend their activities up the peninsula. You can help amplify our message by sending Oceana Gold’s Chair and Directors a message using the form below. You can check out photos from the day on our facebook page. In Waihi today, local community group Coromandel Watchdog have thrown an ‘unwelcome party’ for multinational mining giant Oceana Gold, on their first day in office after buying Newmont’s gold mining operation in New Zealand. A delegation of 30 members of the group, from across the Coromandel, delivered a collection of old computers, along with a letter stating their determination to prevent the company’s planned expansion of gold mining in the Coromandel / Hauraki area, recommending recycling e-waste as a less destructive way of extracting gold. Spokesperson for Coromandel Watchdog Ruby Powell said that in 2012 the United Nations University published findings on e-waste that stated one ton of e-waste contains 40 to 50 times more gold than a ton of gold bearing ore.
Powell said the exploration and prospecting permits that Oceana took over from Newmont today cover over 40,000 hectares and include areas close to Whangamata, Hot Water Beach and Hahei, all of which are vibrant holiday hot spots, with growing tourism industries. The letter also condemns Oceana’s current lawsuit against the El Salvador government for refusing a mine that threatened the country’s last drinkable water source and the notion that a corporation’s rights to make a profit could compete with basic human rights, such as access to drinking water. If you can’t join us in person in Waihi you can send a letter directly to Oceana to express your sentiments by emailing at info@oceanagold.com or by using the form below.